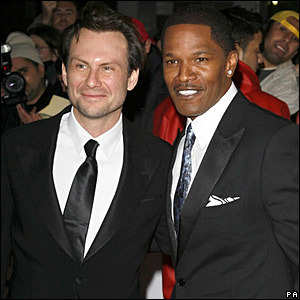 Christian Slater and Jamie Foxx showed up on the red carpet for the event at London's London's Royal Festival Hall. 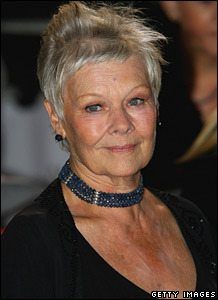 Dame Judi Dench was nominated for best female performance for her part in Casino Royale at ITV's first ever National Movie Awards. Take That performed their new song, Rule the World, which was recorded for the film Stardust. It is being released in the UK in October. Dame Helen Mirren presented Daniel Radcliffe with the award for best male, which he won for playing Harry Potter in the Order of the Phoenix. Emma Watson scooped best female performance, but her father revealed she still gets given pocket money. Yeardley Smith attended the event on behalf of the cast and crew of The Simpsons Movie, which won best animation. Harry Potter and the Order of the Phoenix won best family film. Rupert Grint, who plays Ron Weasley, revealed the cast had started filming the sixth Potter movie. Casino Royale picked up two awards. Its producers, Barbara Broccoli and Michael G Wilson, accepted the award. The show will be broadcast on ITV1 on Saturday at 2130 GMT.